I suspect you all know the fictional story of It's a Wonderful Life, right? Well, I'm here to tell you it's not fiction and the story doesn't just live on a movie reel. It is alive and well in Fillmore, California. And the title character's name is not George Bailey, but Mark Ortega. ...Let me explain. At noon on January 7 of this new year, one of my dearest friends, Mark Ortega, his brother and elderly father escaped from a fire that burned their lifetime home and all of its contents to the ground. Everything! The family could only watch as fire fighters fought to put out the blaze. Instead of Mary Bailey running from home to home to request help for George, one of Mark's nieces sent out an SOS to assist the Ortega family in their crisis via a GoFundMe page. She posted a link to the page via social media outlets and the post was shared and began trending on the site. Family, friends, neighbors, church members, local businesses and alumni from around the globe jumped in to help. Reading many of the comments that accompanied the online gifts I was struck by the outpouring of love, admiration and gratitude for the Ortega family. The parallels from the movie continued. Mark texted me and shared that he was devastated and at a loss about what to do, not realizing that at that very moment a contingent of donors was growing to help his family. 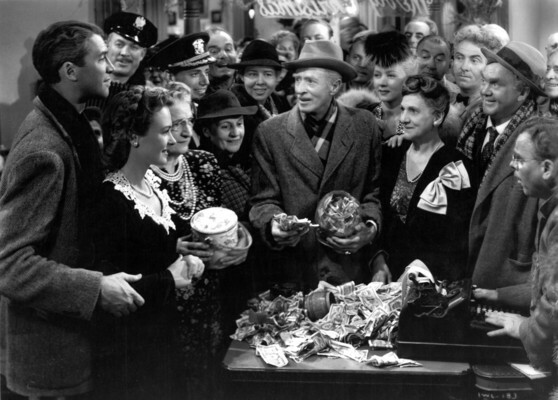 Every time I saw a new gift (from very small to very large), I thought about George Bailey being given the gift of seeing how his life impacted those he was connected to; how at George's darkest hour all those people poured into his living room to lay their love and financial contributions on a card table. What a gift that Mark will be able to experience much the same reception albeit virtually, when he sees his GoFundMe page and all of the people who want to honor the Ortega's legacy of being lifetime boosters for Fillmore. ...And Clarence the angel, what of him? Well, in the current day story, there are many angels--some young, some old, all finding ways to ring a bell for Fillmore's favored son. This is the very best part of fundraising, friends--identifying the need, creating a plan; soliciting a broad base of support; showcasing that support (what GoFundme does well and event coordinators can learn from); and acting with passion, urgency and love to see that plan come to fruition. May we all find ways to contribute in this new year, to remain (or become) vital and relevant. We each have the opportunity and responsibility to craft our time into a Wonderful Life. Cheers to the possibilities in 2017! Thanks for your kind note, Glenn. And thank you for your grassroots efforts to feed the hungry. I know your heart and enthusiasm personally and our community is made better by it. ...Want to grow your results? Sign up for one of our upcoming classes and we'll show you how! Thanks for sending me this heart warming story Connie. I will look forward to many more of your posts. We raised $500 for Growing Hope Farm by baking 72 loaves of bread and the wonderful support of our friends!